amenities, human rights, safe drinking water, street furniture, Vancouver B.C. Nothing much has changed on the Vancouver drinking fountain front since June of 2015, when I blogged about the need for a fountain in the South Granville area. The map of drinking fountains and bottle-filling stations across Vancouver’s 22 neighbourhoods still has a huge hole in it—centred over South Granville and the Fairview neighbourhood. I would dearly like to see that hole filled by at least one drinking fountain near South Granville Street and West Broadway Avenue. How a drinking water fountain might look in front of the Fire Hall Library. 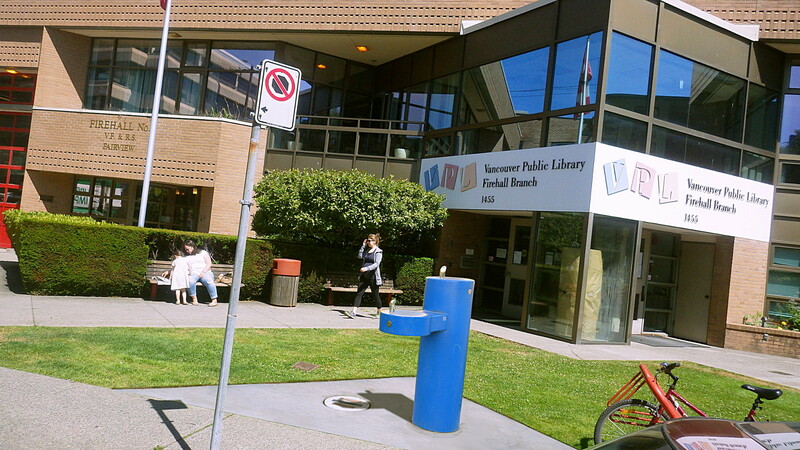 As it was in 2015, my first choice for a new drinking fountain location in the Fairview neighbourhood is in front of the Vancouver Library Firehall Branch at 1455 West 10th Avenue. This is a focal point for the entire neighbourhood—young, old, rich and poor alike, which is exactly where a person would expect to find such a public amenity. A drinking fountain outside the Fire Hall Library would be visible and accessible to a large cross-section of neighbourhood users: residents, library patrons, shoppers along South Granville Street, homeless people and, not least of all, to the cyclists using the 10th Avenue bikeway. 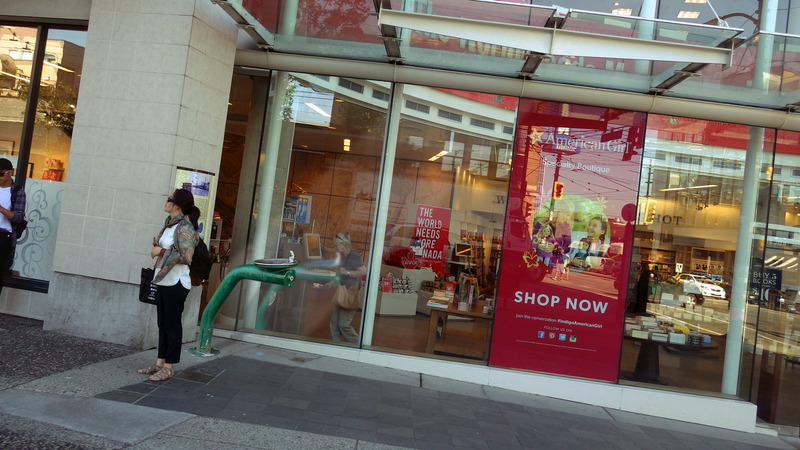 A drinking fountain in front of the Indigo store on South Granville at West Broadway could be quite unobtrusive. 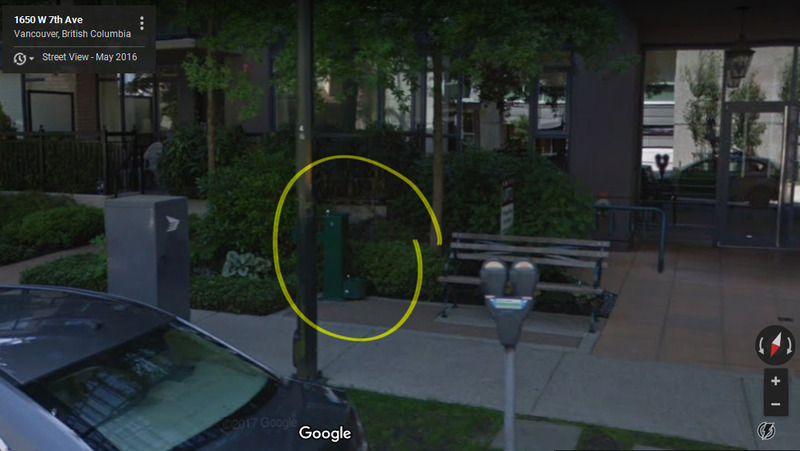 My alternate suggestion for a drinking fountain location is on the southwest corner of South Granville and West Broadway, in front of the Indigo bookstore. This is a high-traffic corner and a major transit exchange. The sidewalks are wide and there are many places where a drinking fountain could be accessibly sited without being in the way. That said, this spot is more for the sake of flexibility; the Fire Hall Library location is a far superior location. When I asked a long time Fairview resident if he thought there were enough drinking fountains in his neigbourhood, he replied that he had never seen one in Fairview. It’s all too easy to miss them. All six of the neighbourhood’s drinking fountains are located northwest of West Broadway and Laurel Street, between 7th and 2nd Avenue; well outside the densely-populated area between West Broadway and 16th. To be fair, I have often times ridden by the dark green fountain located at 1650 West 7th Avenue without noticing it. But the other five are all located north of 5th Avenue—at the southern edge of False Creek, or on Granville Island—so far off on the periphery as to not be in Fairview at all. The gaping hole of drinking fountains in Fairview seems obvious enough looking at a map but what is less obvious, at first glance, is whether Fairview is being shortchanged compared to the other 21 neighbourhoods. After crunching the numbers a bit the answer seems to be both yes and no. 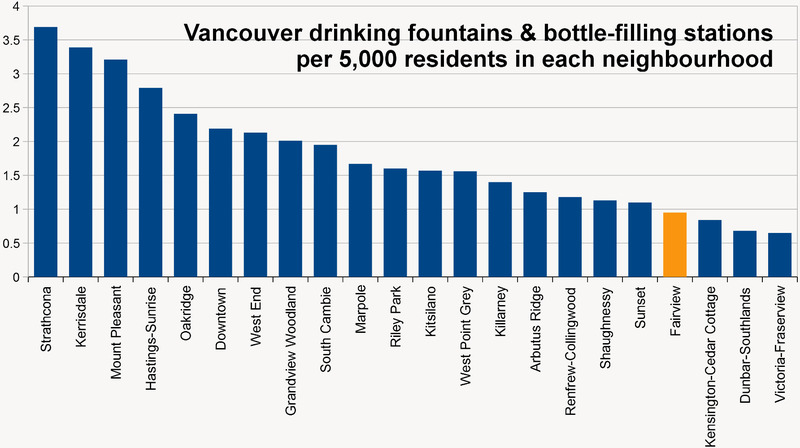 On the one hand, Fairview is fourth worst of all neighbourhoods for its ratio of fountains to people, with less than one drinking fountain (0.95) for ever 5,000 of its residents. 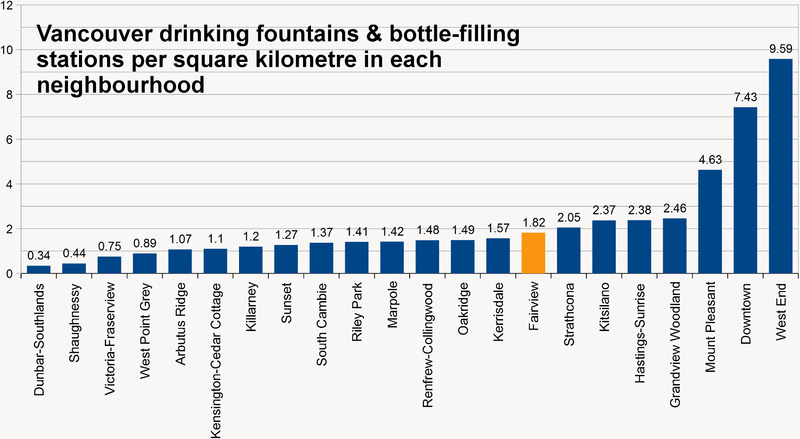 On the other hand, when the ratio is fountains to land, Fairview edges the top third, with 1.82 drinking fountains per square kilometre. Interestingly, Mount Pleasant scores high either way; with the third-most fountains to people and the third-most fountains to square kilometres. The neighbourhoods of Downtown, Grandview-Woodland, and the West End also do well by both measures. Dunbar-Southlands does worst, or second-worst, of all neighbourhoods either way (it would be a different story, I think, if horse troughs were counted). Arbutus Ridge, Dunbar-Southlands, Kensington- Cedar Cottage, Killarney, Shaughnessey, Sunset, Victoria-Fraserview and West Point Grey,, likewise score low by either measure. None of this however, gives any real sense of how and why drinking fountains are distributed the way that they are across Vancouver but one clue to organization is in a small change that the City has made to its drinking fountain map since 2015. The City now distinguishes which fountains are the responsibility of the parks board and which fountains are looked after by the engineering department. The new, dual bottle-filling station along the 10th Avenue bikeway at Cambie. One noticeable change to the landscape of Vancouver drinking fountains since 2015 has occurred on the northeast corner of 10th and Cambie, where the blue drinking fountain that I recall as being new only two years ago has been replaced with an even newer, bluer, water bottle-filling station. Firstly, the “customers” for this water are principally cyclists who will have water bottles to fill up. Secondly, westbound cyclists are going need a full bottle of water. This is the last filling station that they’ll see on the 10th Avenue bikeway for many kilometres. 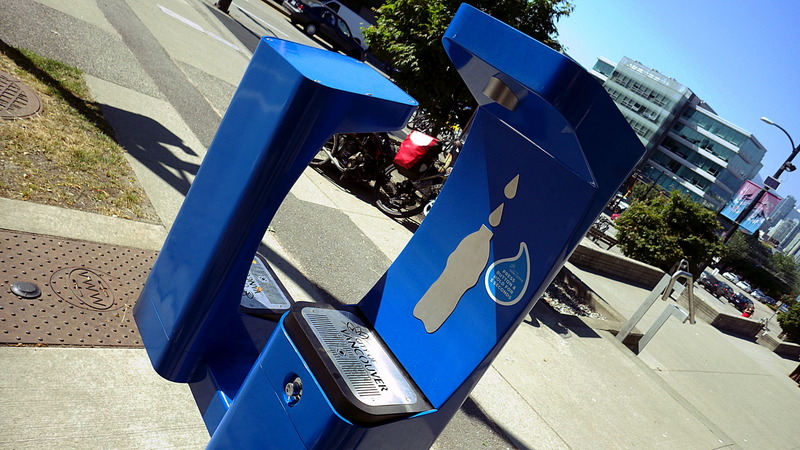 The bottle-filling station at 10th and Cambie is located both on the northern side of Vancouver City Hall and on the western edge of the East Vancouver neighbourhood of Mount Pleasant. If you travel east from that point you will generally never be farther that 500 m to 1 km from the next drinking fountain; all the way to the eastern edge of the city at Boundary Avenue. 13 blocks (2.18 km) if you turn north on Fir Street to 7th. 15 blocks (2.25 km) if you turn north on South Granville to the Granville Loop Park at 5th. 19 blocks (3.22 km) straight ahead at Balsam and 10th in Connaught Park. This then is my final compelling reason to locate a drinking fountain in front to the Fire Hall Library in the 1400 block of 10th Avenue—it places a drinking fountain along the 10th Avenue bikeway almost exactly between the fountains at Cambie and Balsam. As I say, I have no idea what basis is used to choose drinking fountain sites. Some parks have fountains and some don’t. Some fountains are on high-traffic street corners and some aren’t. And I have no idea which City departments are responsible for making the choice. When I have approached the City I have alternately been pointed toward “Water Design” (in 2016) and the “Real Estate and Facilities Management branch” (in 2017). I suppose that the City of Vancouver might be persuaded to act if thousands of Vancouverites get on the phone and all call City Hall requesting a new drinking fountain at the Fairview Fire Hall Library location. While I’m waiting breathlessly for that groundswell of support, I will begin thinking up additional compelling reasons to include in next year’s drinking fountain appeal. The charts and map for this post draw principally on the City of Vancouver Open Data Catalogue—for current drinking fountain totals and locations, neighbourhood boundaries, and 2011 neighbourhood population figures (an alternate source of the same 2011 census data is here). An experienced data wrangler was kind enough to work out the volume of the neighbourhood boundaries for me. Click the images to enlarge them. « Talk about “snail’s pace”—I started this post in May!